ELEGANT- And sophisticated this gorgeous ring promises a carefree and comfortable wear. Its design is meant to accentuate the fingers beautifully. 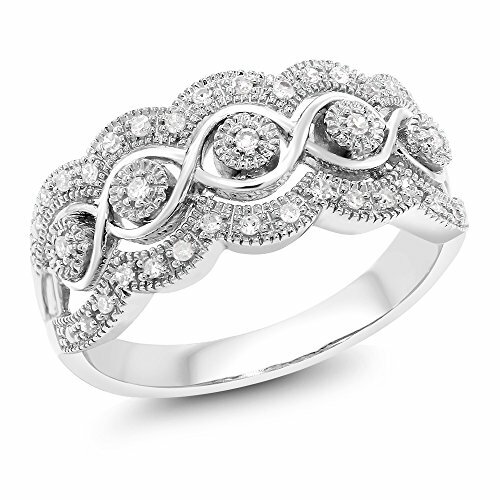 Crafted with solid 14K White gold and genuine single cut round white Diamonds. This ring is truly a gorgeous piece that deserves a spot in every jewelry collection. PURE PERFECTION- This ring is perfect for professing your affections for that special someone or as a just Thinking of you gift. It can be worn with any outfit and is a truly gorgeous addition to any jewelry collection. Gift this beautiful piece to yourself or to someone you love. MADE OF REAL SOLID GENUINE 14K WHITE GOLD - This Ring is made of solid 14K White Gold, with 14k Stamp. This composition makes this ring extremely tough making it suitable for everyday use. Every piece passes rigorous inspection. So you can buy with confidence.